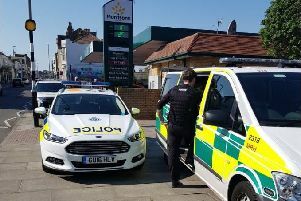 Four teenagers aged between 17-19 have been arrested after a car was stolen in Brighton on Saturday night and driven in Hastings the next day. The Mercedes was stolen from Osborne Road, Brighton. Police tried to stop it before it drove away from them in Hastings and collided with a car in St Helen’s Road. The driver of the other car was not injured. Four teenagers were arrested on suspicion of aggravated vehicle taking. A 17-year-old boy from Brighton, a 17-year-old boy from Hove, a 19-year-old man from Brighton have all been bailed until April 19 while investigations continue. A 17-year-old girl from Kent remains in custody.